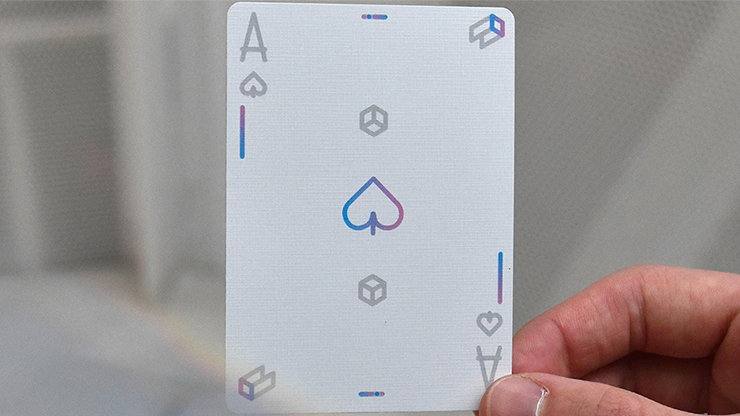 This is a funky deck of cards that don’t distinguish colors between the Clubs/Spades and Hearts/Diamonds. All the cards are the same colors; consisting of gray, a pinkish hue and a blueish hue. There are four extra cards, in addition to the 52 you expect. One is a card that pays tribute to the designer, Ethan King. One is an ad card that conveys certain information that is found in the ad copy below. The third of the three cards is a game card that you pierce with a pen and paddidle. Confused? Look it up! 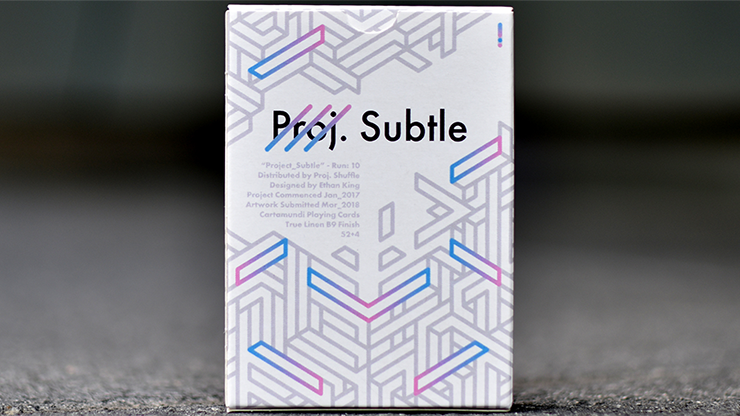 The final card is a Joker that has only the name of the cards in the middle “Proj. Shuffle” and very little design to it. The index pips are all in gray outlined writing as are the numbers. The pips are all unique artwork, again in simple gray outlines. The Court cards are also in gray outline and lack fine detail. The eyes are simple gray circles. 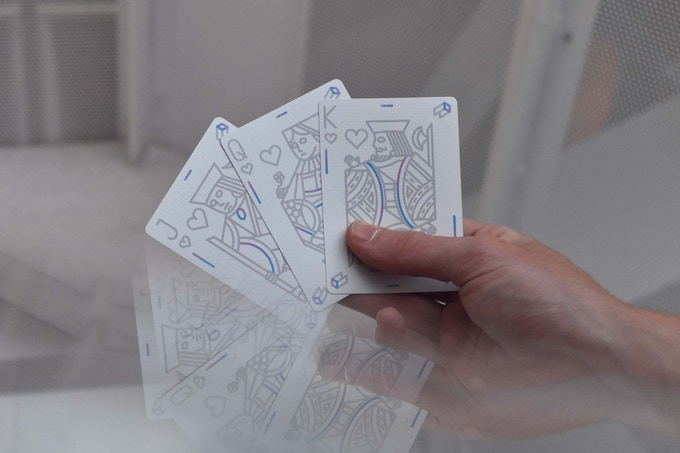 I like this minimalist art work and because of the unique nature of these cards, I expect that many that dabble in cardistry will be drawn to these cards as well. 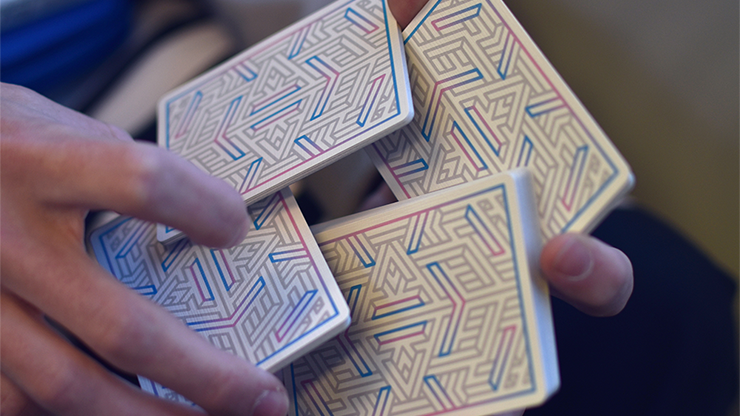 The card back is a two way design consisting of geometric shapes that look like a maze. It is mostly gray with some hues of blue and pink. There is a small white border on the edge of every card. The Subtle Playing cards are my new faves. Although a subtle minimalist design prevails, they stand out for their unique look and card face design. These cool cards can be picked up at any Murphy’s Magic dealer or web based site.